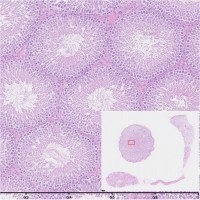 A histological work of quality must give rise to sharp, reliable and easy to read digital images. In view of this, our laboratory offers to scan your slides (via a NanoZoomer Hamamatsu). Simulating a depth of focus through a specific acquisition in « Z-Stack », etc.